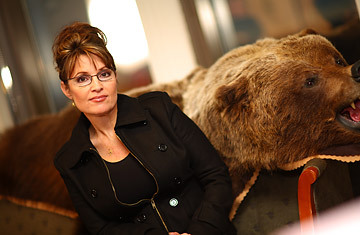 John McCain's vice-presidential running mate, Alaska Governor Sarah Palin. Gov. Sarah Palin's vice presidential candidacy has breathed new life into Alaska's local media, energizing the commentators who have been chronicling the state's tumultuous political landscape  from Troopergate to the Bridge to Nowhere. Here's a few of the Alaskan bloggers who know Palin best and are breaking news about the governor.  Written by a former Alaskan state legislator  and car rental company executive  who grew up in Anchorage and ran as an independent against Sarah Palin for governor in 2006.  Halcro, a critic of Palin since she got into office, first broke the story of Palin's alleged abuse of power in trying to get her ex-brother-in-law fired as a state trooper. He's also written extensively about Palin's stance on the Bridge to Nowhere and a massive natural gas pipeline project.  Recent post: Upcoming conference call between Sarah Palin and oil company executives about the state's plan pipeline plans.  Although it's not technically written in Alaska, this blog has been one of Sarah Barracuda's biggest boosters for more than a year. Launched by Adam Brickley when he was a University of Colorado student in February 2007, it was created to urge the McCain campaign to pick Palin as a running mate. Brickley, who attended the Republican National Convention, got a personal phone call from the Palins the day that news of her candidacy broke.  Since the announcement, the blog has dedicated itself to documenting "Sarahmania," criticizing "left-wing bigotry" and touting the achievements of the governor.  Recent post: A link to a recent US Weekly cover story on Palin, "Babies Lies & Scandal,"  noting that despite the magazine's "smear reporting," more than 80% of of US Weekly readers say Palin would make a good vice president.  Written by an anonymous blogger called AKMuckraker, who settled in Alaska in 1991 and says, "I am just a citizen who is paying attention." Includes commentary about how much attention the Palin children should or should not get from the media and posts about non-Palin related Alaskan political news. A good catch-all for the latest on Palin rumors and links to mainstream news reports.  Recent post: Video of a meeting of the separatist Alaskan Independence Party in which the group's vice chairman says Sarah Palin was an AIP loyalist, but had to distance herself from the party in order to get elected.  Written by staff reporters and editors at the Anchorage Daily News, the blog includes dispatches from the campaign trail and statehouse, as well as links to other articles in the mainstream press about Alaska.  One-stop shopping for Palin news, including answers to inquiries from Daily News readers and summaries of what the national media is reporting about the governor.  Recent post: "Republican National Convention Talking Points" that instruct Alaskan Republicans on how to respond to questions about indicted Alaskan Sen. Ted Stevens, corruption in Alaskan politics and Sarah Palin's qualificiations to be vice president.  Written by Alaskan music teacher Philip Muger, a self-proclaimed "serious environmentalist" committed to addressing "social and economic inequality."  Staunchly anti-Palin, the blog includes a series called "Saradise Lost"  criticizing the governor's stances and alleged misdeeds in office  and posts from guest bloggers including Alaskan radio host Shannyn Moore.